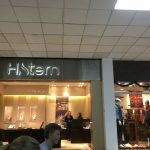 ✅ Verified Review | Cusco airport is not big, but it is very organized and does have boarding bridges. This airport 3300m high from sea level. Excellent view from aircraft's. This airport is always busy. There are some shops and staff are helpful. However, it does need more seating because I saw many passengers standing up. Free wifi is only available for 10 minutes. "too busy for it's size"
We flew from Cusco to Juliaca recently on a trip to Peru. This airport is kind of odd. It is not an extremely busy airport, but is really too busy for it's size. This may have happened recently because we flew into and out of Cusco five years ago, and I don't remember it being crowded. There isn't adequate seating (many people were standing), the shops and food choices were few, and check in was chaotic. I have read that the airport's limitations have been noted by local officials, and a new airport is being planned nearby but could be some years away. I would recommend this airport because it isn't terrible, and there is really no other choice. 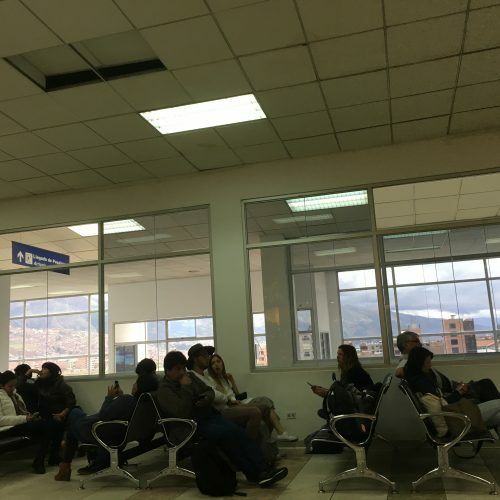 Cusco Airport is another wonderfully crowded and poorly designed airfield in Peru (i.e. Lima, Chiclayo). Byzantine brutalist concrete architecture aside, this airport is by far the worst designed for providing any kind of logical 'flow' for a single-runway airport serving a large metropolitan area. It would seem that nobody in government has looked at what can be done with the cramped space and volume of passengers to try and make a more hospitable, clean and user-friendly facility. Unfortunately, this airport will remain the sole thoroughfare for all international Machu Picchu travelers for the foreseeable future. Maybe Peru can step up to the plate and make some major changes to this facility and take a field trip to Quito, and check out their new airport which is very nice. 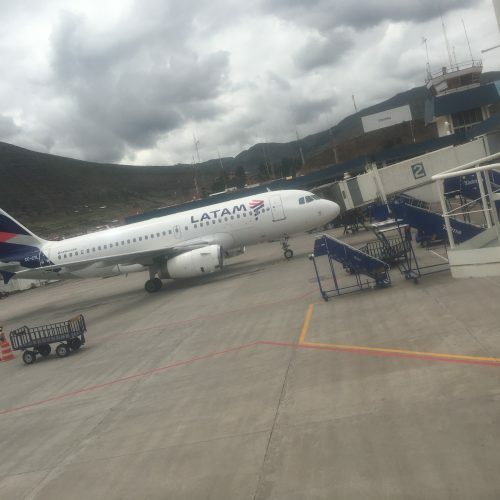 We were stranded in line for LAN Peru at the Cusco airport. Due to LAN's incompetence, it took over 3 hours for us to talk to someone. Their customer service folks were not able to rebook us, and took forever to deal with each traveling group. Not enough reps were there either. As time wore on the problems with the airport restrooms became aggravated. No toilet paper and at 8pm, no more flushing or washing of hands. They shut off the water! Not enough seating and they had all the doors open so it was freezing. We couldn't get out of line or lose our places. 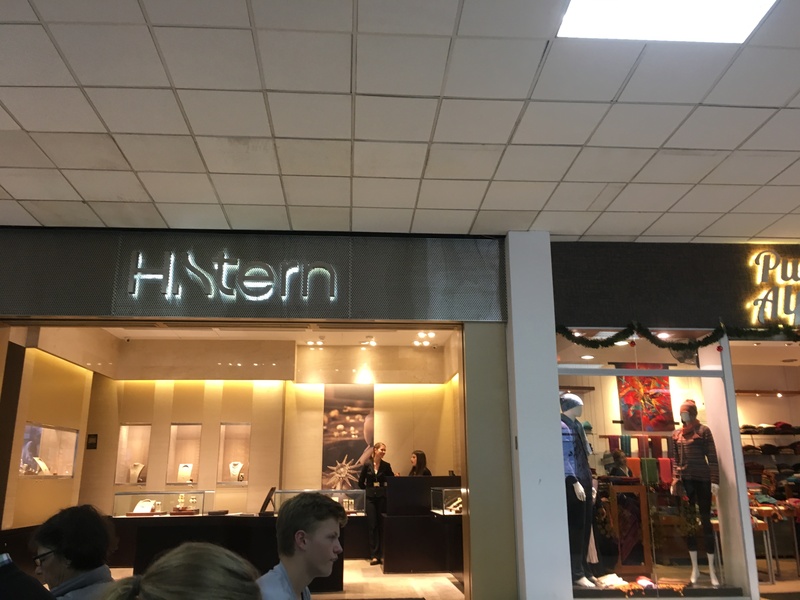 No food or water available after 8:30pm for sale anywhere in the airport. We couldn't leave until we saw the rep so stuck in the freezing cold. Upstairs waiting area being torn up and not enough seating either.